A new report on Internet freedom was launched by Freedom House, an organization which monitors freedom around the world. The “Freedom on the Net” study surveyed 15 countries on the basis of two key components: access to Web and mobile technology and the free flow of information through it. The report covered events that took place in the years 2007 and 2008, identifying new emerging threats to Internet freedom. The report also states that there is more Internet freedom than Press freedom, and that activists are becoming more creative in resisting governmentally imposed restrictions on the Internet. In his video interview with Global Voices Advocacy, Robert Guerra, Project Director for Freedom House's Global Internet Freedom Program, talks about this new initiative and shares some of his thoughts about threats to freedom of online expression. Washington – April 1, 2009 – A new study from Freedom House warns that the rights of internet and mobile phone users are increasingly at risk as governments, both repressive and democratic, expand their ability to monitor and control online activity. Freedom House developed the pilot study to better understand emerging threats to internet freedom. Freedom on the Net evaluates each country based on barriers to access, limitations on content and violations of users’ rights. It captures not only government actions, but also indicates that citizens are resisting government attempts to restrict their online activity. Findings from the study, which covers events from 2007 to 2008, will be formally released Wednesday to a conference of more than a thousand bloggers in Berlin, Germany. Freedom House hopes to expand the study to examine internet freedom in all countries of the world. Cuba received the lowest score in the study because of the Castro regime's near total control over internet access. 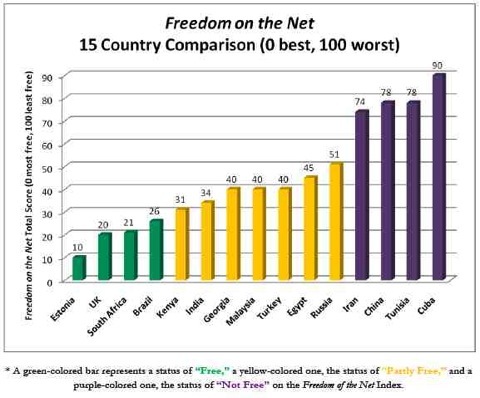 Three other countries received a ranking of Not Free: China, Iran and Tunisia. The vast majority of the countries studied received a Partly Free ranking: Egypt, Georgia, India, Kenya, Malaysia, Russia and Turkey. Estonia tops the study as the country with the most internet freedom. Other countries ranked Free are: Brazil, South Africa and the United Kingdom. The study's China report shows a particular paradox: a country with an estimated 300 million online users that also has the world’s most highly-developed censorship apparatus. China ties with Cuba for the country with the most curbs on users’ rights, including prosecutions for online activities, surveillance and extra-legal harassment of bloggers. Growing Access, Threats: In six (40 percent) of the countries examined, internet use doubled between 2006 and 2008. Mobile phone penetration doubled in three (20 percent) of the countries. At the same time, six countries (40 percent) sentenced a blogger to prison and a third of the countries introduced new internet-restricting legislation. Methods to control and censor traditional media are seeping into the new media environment, but are not as common yet. In addition to imprisonment, torture, and intimidation of internet activists, governments also engage in online harassment by hacking or using technical means to shut down websites. Censorship Proliferates: Eleven countries (73 percent) targeted political content in at least one instance, and general censorship and control was present in every country studied. Censorship techniques included technical filtering, manual content removal because of government directives, intimidation, judicial decisions and sophisticated manipulation of online conversations by undercover agents. Outsourcing Censorship: More governments are requiring private actors such as internet service providers, blog hosting companies, cybercafé employees and mobile phone operators to censor and monitor users. This outsourcing affects both local and multinational companies. More Internet Freedom than Press Freedom: For every country in the study—with the exception of the United Kingdom—their internet freedom score outperformed their score in Freedom House’s Freedom of the Press study, which principally examines broadcast and print media. These differences were most pronounced in the Partly Free countries such as Kenya, Russia and Malaysia. Civic Activism Increases: Citizens are resisting government control by blogging, using code for sensitive keywords and organizing protests and advocacy groups through social networks like Facebook. Cuba is one of the world's most repressive environments for internet freedom, despite a slight relaxation of restrictions on computer and mobile phone sales in 2008. There is almost no access to internet applications other than e-mail and surveillance is extensive. Cuba is one of the few countries with laws and regulations explicitly restricting and outlawing certain online activities. China is home to the largest population of users, but its rulers employ the world's most sophisticated, multi-layered, and wide-ranging apparatus for repressing internet freedom. It has the most cyber dissidents behind bars, at least 49 as of mid-2008. In addition, cyber dissidents are sentenced to longer prison terms than elsewhere, and extra-legal forms of harassment and violence are on the rise. Authorities and private providers employ hundreds of thousands to monitor, censor, and manipulate online content. Iran uses a complex system of nationwide content filtering, intimidation, detention and torture of bloggers, and restriction of broadband access to subvert freedom of expression online. Authorities detained and questioned more than a dozen bloggers in 2008 and a bill enabling the death penalty for online activities passed its first reading in parliament. Russia does not engage in significant technical blocking or filtering, but authorities are increasingly removing content through behind-the-scenes pressure. Internet freedom is threatened by a rise in attacks and criminal cases targeting bloggers, while the government manipulates online discussion by funding its own propaganda websites. Egypt does not engage in widespread censorship of the internet and the government has actively encouraged access to technology. But security services and their allies are known to monitor users and use low-tech methods of control such as intimidation, detention, imprisonment, and torture to silence online activists. South Africa has a high level of digital media freedom, but a majority of citizens are unable to access the internet because of high costs and language barriers. Political content is not censored and bloggers are not prosecuted for online activities. Unlike other countries in the study, South Africa has more people accessing the internet on their mobile phones than from computers. The United Kingdom has one of the world's freest environments. But there are growing concerns about the widespread retention of user data by service providers and the permissive environment for “libel tourism” (in which the UK allows individuals, often from authoritarian countries, to sue authors whose work is available in the UK, including online versions). The procedures used by the private Internet Watch Foundation to remove harmful internet content lack transparency and the appeals process could be improved.